Following the collapse of the stack n°9 of the viaduct on the Polcevera, which caused a huge disaster on august 14th2018, we want to elaborate on the situation surrounding an artifact of great engineering importance that only now, albeit in a terrible way, has reached an enormous reputation. After a technical description, addressed above all to the fateful easel-antenna with relative cable stayed stringing system, that constitutes the essence of the balanced system of the stack n°9, we pass to evaluate the probable causes of the collapse, the structural rehabilitation interventions performed twenty years ago on the stays of the balanced system of the stack n°11 and to hypothesize what could have been done on the basis of a continuous structural health monitoring of the artifact. Monitoring aimed at planning a targeted and timely maintenance, especially in the light of what happened is not to be considered an isolated fact, but the continuation of a series of events mainly related to the conspicuous age of national road heritage. In the E80 junction, which connects the A10 Genoa-Savona motorway with the A7 Genova-Serravalle motorway, the crossing of the Polcevera torrent valley and a densely populated area between the Cornigliano area and the Sampierdarena area has been solved by a large and unitary concept viaduct. It was built by the Condotte d’Acqua Company in the mid-60s of the last century: the construction site opened in 1964, the work has been completed in 1966 and was regularly opened to traffic in 1967. The viaduct designer was the prof. Riccardo Morandi who, together with Freyssinet, Leonhardt and Maillart, with his decidedly innovative concepts, has changed the way of conceiving and building bridges all around the world. This artwork is the classic example of the inclusion of a large infrastructure in a dense urban and industrial network, with the intention of creating a correct composition from a formal and landscape point of view. Similar concepts were implemented, almost in carbon copy, in two other sites: on Lake Maracaibo in Venezuela (General Rafael Urdaneta Bridge) and near Beida in Libya (Bridge on Wadi al-Kuf). Morphologically the Polcevera viaduct consists of four connecting tracks and the main viaduct. The latter, an example of extreme rationalism in which the essential geometry traces the lines of force that are capable of guaranteeing balance under the influence of its own weight and the road traffic, consists of a sequence of eleven spans of variable lengths between 65 and 208 m. The spans find their conceptual link in a series of equally prestressed concrete decks, 36 m long, constrained to simple supports on trestle systems for minor spans and on balanced systems for higher spans, i.e. those constituting the three main spans that allow the passing of the railway yards and the river bed from which the viaduct draws its name. 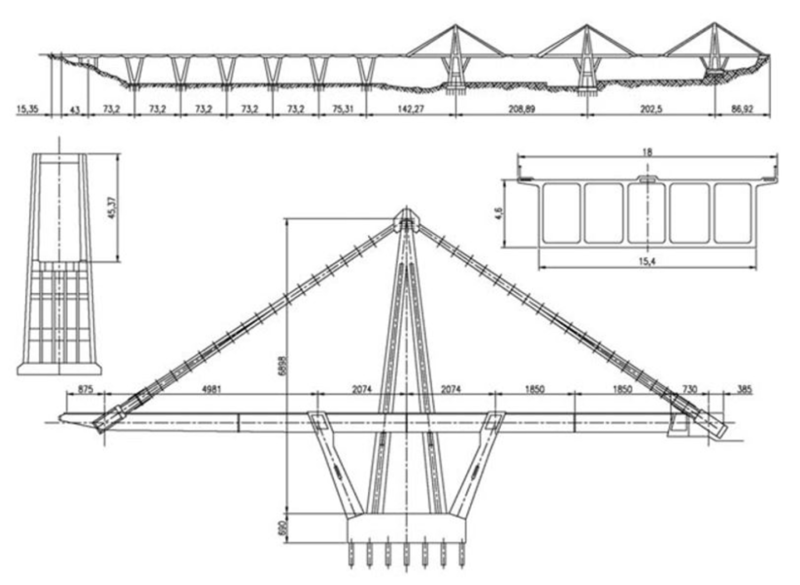 The first portion (trestle system, sections 1 to 8 in Fig. 1) consists of two reinforced concrete inclined piers, connected at the top by a double cantilever girder of variable length, carried by a foundation raft which in turn rests on drilled piles. The second portion (balanced system, sections 9 to 12 in Fig. 2) is the more interesting one, both for its particular engineering concept, and because the first of them, starting from the Savona side, is the one that collapsed on August 14th 2018.
and a continuous deck-girder of cellular type prestressed concrete, with top and bottom slabs and six longitudinal ribs, leaning on the trestle. The connection between the deck and the stay-cables is achieved through a stiff prestressed concrete cross girder, whose projections on each side of the deck provide the anchorage of two stay-cables passing over the top of the “antenna” at a height of 90 m above the ground and 45 m from the transitable viaduct lanes. Additionally, concrete shells are casted around the cables. The function of these shells is, besides protecting the steel cables, to reduce the cable elongation during the passage of moving loads because the shells themselves are prestressed. and at least theoretically, the elimination of the cracking of the sheaths and the consequent presumed elimination of the possibility of damaging the steel by atmospheric agents. In addition the balanced system, at least along the girder, is practically insensitive to thermal variations because it is connected to adjacent systems by means of beams resting on one of the freely sliding constraints. This was a quick technical description explaining the intuitions of prof. R. Morandi at the base of a great engineering work that, with its boldness, has allowed to overcome great spans. The viaduct is more than 1000 m long and the portion affected by the collapse, around the pile 9, has a development of about 200 m.
In 1992 the stack 11 was structurally repaired. Following visual and instrumental inspections, in concomitance with important maintenance interventions, a widespread degradation was found on the stays of the three balanced systems, and a series of further concentrated degradations in the balanced system corresponding to stack 11. The purpose of on-site investigations was to determine the mechanical characteristics of the concretes and reinforcement steel and to evaluate the state of the prestressed cables, estimating their stress level. On the concretes, a widespread diagnostic campaign was carried out by means of sclerometric tests, ultrasound, Windsor gun, pull-out and laboratory tests on cylindrical specimens collected on-site. Concerning the steel, tensile breaking tests on samples of bars and strands were carried out. In addition to the visual inspection, the stays and prestressed cables were tested by means of endoscopy, measurements of tension release on specimens extracted from the concrete coating and reflectometric investigations. Measurements of the dynamic behavior were also taken to evaluate the level of stresses. The repair of the damaged stays was performed by installing conventional cable-stays placed side by side to its vertical faces and at the same time adopting a short cable system in its terminal part in order to modulate its general stress state by transferring the pull from the old cables to the new ones, using the stiffness conferred by the reinforced concrete part also in the repaired final structure. The works required no major stopping of traffic. Alternative solutions like the total replacement of the stays would have implied greater problems of structural safety and above all the traffic paralysis for a long period of time. In the same period local interventions were performed on the balanced system corresponding to the stack 10. Based on the findings of the safety factor calculation (Fig. 6), the critical situation was concentrated in the top attachment section of the antenna and therefore the interventions were limited to these zones, increasing the safety of the whole system. Finally, there were no interventions performed on the stack 9 balanced system, the one that collapsed, since the levels of corrosion were limited. From the aforementioned examination it is highly probable that the recent catastrophic event was due to the collapse of a balanced system stay of the stack 9, due to progressive deterioration of the tie rods. The intensified traffic was considered to be a factor, but it should be remembered that the official test for commissioning was performed with a column of military loads at complete occupation of the span in question – this renders the increased traffic insignificant. The weather conditions of the moment of collapse could play an important role. The torrent of meteoric water on the deck, may have caused excessive vibrations that, exalted also by the consistent winds, may have lost the support of the central span on the stack 9, and over-stressed one of the stays, already in critical conditions for the high level of deterioration of the tie rods. Many eyewitnesses also reported a lightning that struck the “antenna” in its summit where the tie rods curve. Ultimately, even if exalted by contingent factors, the root cause lies in the substantial structural degradation. What was supposed to be a key element of the famous M5 system of prof. Morandi, namely that the concrete lining of the stays acts as a corrosion protection, turned out to be a system of concealment that in fact prevented direct inspection. Prof. Morandi himself published an article in 1979 explaining that corrosion in prestressed structures is especially critical and therefore such structures need to be closely monitored and maintained. Only 10 years after the commissioning of the viaduct prof. Morandi also recognized problems related to the extremely aggressive environment: constant presence of harmful vapors due to the high salinity of the air, mixed with the aggressive fumes of the numerous factories present in the area. The first elements that paid the price were cadmium bearing coatings of simply supported beams which were corroded in less than 5 years and were replaced with stainless steel elements. In 1979 prof. Morandi proposed the need to remove all traces of rust and to protect and restore the continuity of the concrete by applying epoxy resins and elastomeric materials into visible cracks. As described, the first real intervention was made in 1992 but was mainly limited to the stack 11. Many years of warnings from various sides led to the planning of a conservative rehabilitation intervention. A call for tender for the retrofitting of the stays of stacks 9 and 10 was published by Autostrade only in May 2018. The retrofitting, which was of course never realized, also planned the installation of a structural health monitoring system on the stays. One may wonder how a structure of such importance that showed corrosion problems early in its life had not already been placed under continuous and constant instrumental control. In a complementary way and not absolutely substitutive to all the so-called diagnostic investigations (those, for example, carried out in the early nineties on the Polcevera viaduct), the continuous static monitoring, for controlling deformations, deflections, rotations, forces, temperatures and so on, is now a reality, even if it is struggling to gain a foothold in the sector of communication arteries, both on road and rail. The static monitoring must be accompanied, with even more significant implications, by the dynamic characterizations and dynamic monitoring that, according to the latest and most modern approaches, even tend to integrate into a single control mode. Using high performance accelerometer, it is possible to define a mapping, a sort of identity card of the artifact, or parts of it, in terms of its own frequencies, modal forms and damping. Contrary to what was a standard method a few years ago, in which we had to resort to classic modal analysis (EMA), with an external forcing generated by enormous bridge shakers, difficult to transport and with a high cost of employment, now, thanks to by now consolidated technique of operational modal analysis (OMA) it is possible to obtain the dynamic parameters, even with better reproducibility and reliability, referring only to the response (output only analysis) to the environmental random excitation. The search for modal parameters, by means of stabilization diagrams, is based on sophisticated algorithms that can develop entirely in the time domain (SSI) or in the frequency domain (LSCF). The periodic repetition of these investigations, and of the consequent analyzes, at predetermined intervals or indicated by the occurrence of particular events, allows to evaluate the actual variations of the modal parameters, harbingers of more or less substantial modifications of the structure, or of the part of it subject to investigation. Following a standard praxis in other parts of the globe for some years now, it would have been possible to permanently install, as an appendix to the structure itself, low noise 3-axial MEMS accelerometers that integrate the electronic conditioning and analog/digital converter and can be wired using a standard ethernet cable to an on-site PC, which, via modem, transmits the data remotely to all users involved in the control. With this solution, in addition to the real-time measurement of accelerations and the consequent analytical determination of the vibration velocity, a parameter of high structural significance as in close correlation with the deformation, and therefore with the tension, of the structural element on which the transducer is installed, you would have had the opportunity to make OMA analysis whenever the need was presented, in a timely manner and low costs (for the lack of need to have to physically go on site and for the fact of not having to use expensive high-end equipment) . A structural health monitoring program having low noise MEMS accelerometers located on the deck and each of the 12 stays, with decidedly contained costs, would have allowed to evaluate, in real-time, the minimal variations, local and global, of the dynamic behavior of the Polcevera viaduct. In particular those accelerometers on the stays would have allowed to keep the level of tension under control: if not the absolute one, certainly the differential level with respect to the installation date. Based on the results that would be derived in terms of temporal progressiveness, the system would help to plan maintenance interventions in the most suitable times and ways. In this case we refer to the viaduct on the Polcevera, but what has been said can be valid for the entire national road park, definitely dated and often neglected. It is not by chance that what happened in August 2018 is the latest in a series of dramatic events that took place in recent years. Going back just two years, at least four disquieting events can be cited. In October 2016, overpass Annone, in the province of Lecco, collapsed following the passage of a TIR carrying steel coils, causing the death of the driver of a car that passed through the underlying SS36 that connects Milan to Brianza. The 2017 was an “anno horribilis”. The collapses of the Fiumana Allaro bridge in Calabria in January and of the viaduct of the Fossano ring road, in the province of Cuneo, in April, fortunately did not cause casualties. But the collapse of the overpass on the A14, between Loreto and Ancona, caused the loss of life to two people and wounded many, with extensive involvement of the cars below. To put an end to this down going spiral, structural health monitoring and maintenance are the two key words able to allow the protection of the huge heritage concerning the national road network. Technical Director and founder of the company MARZULLO Srl, renowned study of Architectural Design and Structural Engineering of Rome in business since 1990, he began his career working for 15 years, from 1972 to 1987, at the Studio of Prof. R. Morandi, covering initially the role of Designer, then of Project Manager, finally of Head of Project Activities. Technical Director and founding member of the ESSEBI Srl that since 1992 deals with structural health monitoring operations and structural diagnostics. For over ten years he has been actively involved in structural dynamics, with particular reference to its implementation in terms of operational modal analysis. ESSEBI performed many instrumental monitoring, dynamic tests and experimental dynamic characterizations on bridges and viaducts.